Learn even more: chemistry will help you learn all the other human bioscience modules! Atoms are the basic unit of all matter. All the things in the world (and actually the whole universe) are made of atoms. ​Atoms will vary in the number of neutrons and protons in the nucleus and the corresponding number of orbiting electrons. An element is a substance which is made up of only one type of atom. That is, each atom is identical in the number of protons and electrons it has. In the table, you can see the most common elements found in the body. There are a couple of important 'take-home' messages here. That symbol does not always include the first letter in the name of the element. There are historical reasons for this. ​These symbols are used on bags of fluids given to patients, clinical notes and blood tests so it is a good idea to memorise them. A molecule is a combination of atoms. ​Atoms in a molecule are described as being bonded together. The bond comes about by sharing of the outermost electrons between adjacent atoms in molecule. This makes for a very strong bond. A compound is any substance made up of molecules which are combinations of different atoms. ​Each molecule can be represented by a chemical formula that indicates which atoms are present and how many of each type of atom are present. ​The formula is a simple way to describe a molecule but it does not give any information about how the atoms in a molecule are arranged. This can be important as there are some molecules (isomers) with the same combination of atoms but in each molecule they are arranged differently. In a compound the atoms are bonded together. In other cases, the atoms (and molecules) are together but not strongly bonded. This is called a mixture. Bonds between atoms can be produced or destroyed. The bond making, or bond breaking events, are the basis of chemical reactions. The starting materials are the ‘reactants’. The end results of the reaction are called the ‘products’. The amount of each reactant determines how much product will be made by the reaction. In the real world, we do not work by adding single atoms to other single atoms since we cannot separate them at that level. Instead we use a measure termed a ‘mole’. One mole of any chemical substance contains the same number of atoms or molecules and it is expressed in grams (g). A mole contains 602,000,000,000,000,000,000,000 atoms or molecules of the chemical of interest. A solution is a mixture where the liquid is the solvent and the thing dissolved in it is a solute. In a solution of salt water, like the photo, the salt is the solute, the water is the solvent. In the human body, the fluid inside your cells are solutions and water is the solvent. Molarity is the concentration measurement used on pathology reports to indicate the levels of electrolytes in the plasma or other molecules in the body for diagnostic purposes. However, molarity is not the only way we can describe the concentration of a solution. We can also describe it as %w/v which is how many grams of solute is dissolved in 100 mL of solvent. So that 150 mM NaCl could also be expressed as 0.9% w/v. ​An ion is a charged atom or molecule. In any atom, the protons each have a single positive charge and each electron has a corresponding negative charge. In a neutral atom: the number of electrons = the number of protons. When ions are present in water, then the water can conduct an electrical current. For this reason, the source of the ions is called an electrolyte. 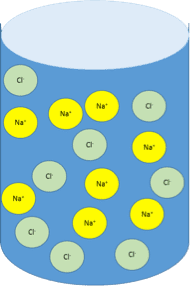 In clinical practice electrolytes are used to describe the ions dissolved in body fluids. Not all compounds will dissociate into ions when in solution. Sugars such as glucose are an example of this in that they readily dissolve in water but the molecules of glucose don’t ionise. An acid is a compound which, when in solution, dissociates to release a hydrogen ion. The pH scale is a mechanism for describing how many hydrogen ions there are in a solution. It tells us whether a solution is acidic, alkaline (basic) or neutral. The pH scale ranges from 0 to 14 with the central point of 7 being neutral. Acidic solutions have pH values below 7 and alkaline solutions have values above 7. In pure tap water there are 0.0000001 moles of hydrogen ions per litre of water. This method of writing out the hydrogen ion concentration is cumbersome. The pH scale is a simpler method to describe the hydrogen ion concentration. It utilizes the number of decimal places: 0.0000001 becomes pH 7. That is, the decimal place is seven places to the left of the numeral ‘1’. Another example, which is an acid, is gastric juice. It has a concentration of hydrogen ions equal to 0.01M. The pH is then 2. An alkaline solution in the body is pancreatic juice. It has a hydrogen ion concentration of 0.00000001M. The pH of pancreatic juice is therefore 8. (For those old enough to remember learning how to use logarithmic tables in school, the calculation for this is based in log to the base ten (log10) mathematics). It is important to note that small changes in pH are reflected in large changes of hydrogen ion concentration. ​The concentration of hydrogen ions in body solutions can have a profound effect on body functions. Normal pH ranges from 7.35 to 7.45 for arterial blood. The body uses chemical buffers to stabilise pH and prevent large fluctuations in hydrogen ion concentration. Buffers are made up of a pair of molecules where one is a base and the other an acid. If the pH is too high (indicating it is too alkaline) then the acid dissociates to release hydrogen ions returning the pH to normal. If the pH is too low (indicating it is too acidic) then the base can mop up the excess hydrogen ions. An important example in the body is the carbonic acid – bicarbonate buffer system. The definition of an acid is that is donates its hydrogen. Carbonic acid (H2CO3) releases one hydrogen to form a bicarbonate ion and a hydrogen ion. The definition of a base is that it will accept a hydrogen ion. Bicarbonate (HCO3-) ion can pick up a free hydrogen ion to form carbonic acid. Macromolecules are molecules containing many atoms. ​A lot of substance in your body is made up of macromolecules. ​In all three, carbon is a major component. Thus these three classes of macromolecules are part of the bigger group of organic compounds. Carbohydrates are organic molecules made up of carbon, hydrogen and oxygen atoms with twice as much hydrogen present as the other two. The simplest carbohydrates are monosaccharides ('single sugars'). These are single chains of carbon with hydrogen and –OH groups attached to the carbons. In solution the longer chains will form rings. In the diagrams, you see two common monosaccharides —glucose and fructose — shown in their ring forms. Count how many of each atom is present. (The artists have used a common short hand where each 'corner' of the ring is where a carbon atom actually is). ​Fructose and glucose are isomers of each other and the body treats each one differently. Join two monosaccharides together and that is a disaccharide. Sucrose (table sugar) is a disaccharide of glucose and fructose. Lactose is a disaccharide of glucose and galactose. Join many, many, many monosaccharides together and that is a polysaccharide. Animals store glucose in the form of the polysaccharide glycogen. Starches are plant polysaccharides made from glucose. Proteins are chains of amino acids. When a protein is assembled, the amino acids are joined together by peptide bonds. Each protein is a unique chain of many, many amino acids. Each amino acid is an organic molecule and it will have one section in common with all other amino acids and one section that is unique – a side chain. The side chain gives it specific chemical properties. The properties of the protein are determined by which amino acids are included and their sequence in the chain. The side chains on the amino acids in the protein determine the protein’s shape, it’s resistance to being stretched and it’s capacity to bind with other molecules. In this way, a protein’s structure and function are linked. ​The local environment of a protein are important for its function. Temperature, pH, and the number of ions present, must be correct for correct function. Changes in the local environment can limit function and severe cases, such as acid environments or very high fevers, can damage proteins irreparably altering the protein and leaving it non-functional (termed ‘denatured’ which means unable to do what nature intended). One group of proteins, enzymes, are biological catalysts. A catalyst is an agent that may either be essential for a chemical reaction to take place or will greatly increase how fast a chemical reaction will take place. Most of the chemical reactions that keep the body alive and function would be too slow if it wasn’t for the presence of an enzyme. Proteins are a unique combination of amino acids. This means that each protein has a unique three-dimensional structure. Just like each house will contain uniquely structured individual rooms, so each protein will have parts (called 'sites' or 'domains') whose three-dimensional structures are unique to that protein. In the case of enzymes this means that each enzyme will possess an active site which has a unique three-dimensional structure that can only accommodate particular molecules (or maybe a particular part of a macromolecule). The enzyme which splits lactose into glucose and galactose is a completely different protein to one that chops up starches into glucose molecules. That is why we can all digest starch but some of us lose the ability to breakdown lactose. In the body, we have a specific enzyme that can release the glucose molecules from starch, which is a particular type of carbohydrate. However we do not have an enzyme that can break down cellulose which is the carbohydrate we find in plants. Like carbohydrates, lipids are macromolecules largely made from carbon, hydrogen and oxygen. The major difference is that lipids have less oxygen present and the arrangement of the atoms means that lipids are not readily dissolved in water. Fatty acids are long chains of carbon with hydrogens attached to the carbons. They both have the same end group. The hydrogen atoms that would be bonded to the carbon atoms aren’t drawn in either. Each fatty acid will have a particular number of carbons in its chain. ​The bond between two atoms in molecule involves sharing electrons. Sharing a single pair is called a single bond represented by a single line. The upper molecule only has single bonds. Chemists categorise this as a saturated fatty acid. Triglycerides are formed from the combination of three fatty acids all joined to a 'backbone' glycerol molecule. These are the most abundant lipids in the human body and in food. ​Which ones are joined will vary from molecule to molecule. Phospholipids are phosphorus-containing lipids which resemble triglycerides in structure. ​The difference in structure means that unlike triglycerides (which won’t interact with water) phospholipids have a part of each molecule (the part with phosphorus in it) that does interact with water. Sterols are another product of fatty acids however in this case the molecule is arranged in a set of connected rings. Aside from its own functions, cholesterol is the source of many different sterols found in the body. In this diagram of a sterol, all the atoms are drawn in: the ring of carbon, the hydrogen and a single oxygen atom. ​Like triglycerides, cholesterol does not interact well with water.